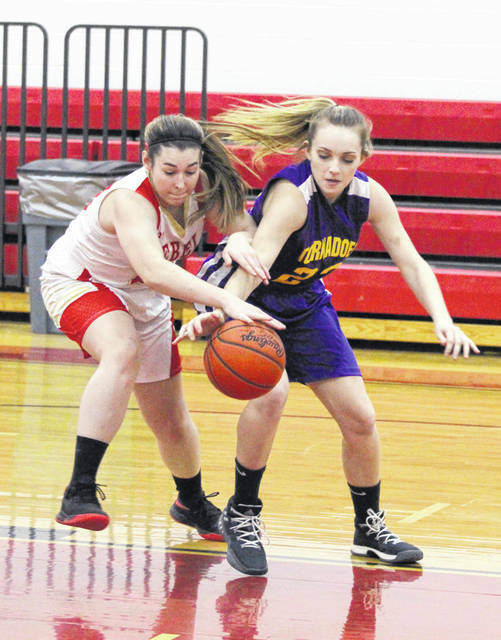 South Gallia junior Christine Griffith, left, and Southern junior Shelby Cleland battle for a loose ball during the second half of Thursday night’s TVC Hocking girls basketball contest in Mercerville, Ohio. MERCERVILLE, Ohio — One team was getting its first win. The only question coming in was which one? 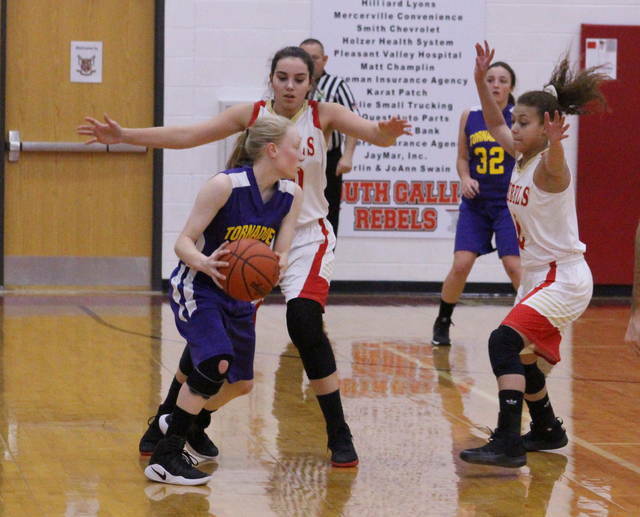 The South Gallia girls basketball team had three players reach double figures and held visiting Southern to just 26 percent from the floor on Thursday night during a 51-33 decision in a Tri-Valley Conference Hocking Division matchup in Gallia County. 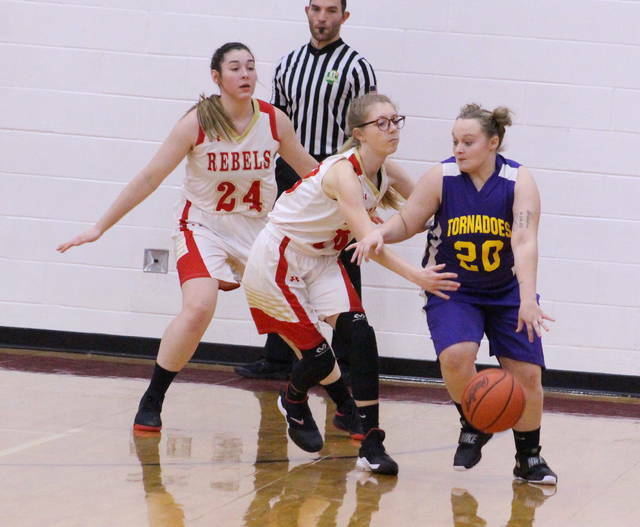 Both the Lady Tornadoes and the host Lady Rebels entered Thursday’s contest with identical 0-4 overall records that included 0-2 marks within league play. And, early on, those similarities matched up on the court as both teams built leads en route to a 7-all tie midway through the opening frame. Olivia Johnson netted a free throw at the 3:29 mark, allowing South Gallia (1-4, 1-2 TVC Hocking) to secure a permanent lead at 8-7. The charity toss also sparked a 10-6 run that ended the first quarter with the Red and Gold holding a 17-13 edge. The Lady Tornadoes (0-5, 0-3) were never closer as SGHS made a quick 10-1 run over the first four minutes of the second canto, giving the hosts their largest lead of the opening half at 27-14. SHS, however, countered with a 9-4 run over the final 3:10 of the first half, allowing the guests to close to within 31-23 at the intermission. The Purple and Gold — who had eight turnovers in the first half, including only three in the opening frame — matched that number in the third quarter alone. The guests went only 1-of-9 from the field and trailed by a 43-28 margin headed into the finale. The Lady Rebels built their largest lead of the night at 51-30 on Kiley Stapleton trifecta at the 2:38 mark of the fourth. Southern closed regulation with three unanswered points to wrap up the 18-point outcome. South Gallia outrebounded the guests by a 39-24 overall margin, including a 14-6 edge on the offensive glass. The hosts also committed 20 turnovers in the triumph, one less miscue than Southern. SGHS connected on 19-of-56 field goal attempts for 34 percent, including a 4-of-17 effort from 3-point range for 24 percent. The Red and Gold were also 9-of-18 at the free throw line for 50 percent. Stapleton hit three trifectas and paced South Gallia with a game-high 21 points, followed by Amaya Howell with 12 points. Christine Griffith added a double-double effort of 11 points and 12 rebounds. Olivia Johnson was next with five points to go along with a dozen boards, while MaKayla Waugh completed the winning tally with two markers. Howell also hauled in six caroms for the hosts. The Lady Tornadoes made 12-of-47 shot attempts overall, including a 3-of-14 performance from behind the arc. The guests were also 6-of-12 at the charity stripe for 50 percent. Kayla Evans paced the Purple and Gold with 13 points, followed by Phoenix Cleland with 10 points and a team-best seven rebounds. Brooke Crisp and Lily Allen rounded the scoring out with five markers each. Shelby Cleland grabbed six rebounds for SHS and Crisp also hauled in four caroms. Southern’s biggest leads were 5-2 and 7-4 less than three minutes into regulation. South Gallia — which played without three starters — returns to action Monday when it travels to Waterford for a TVC Hocking contest at 6 p.m. The Lady Tornadoes also hit the TVC Hocking hardwood on Monday night when they welcome Wahama at 6 p.m.